Our family involvement with livestock started way back in the 1930's with the granting of grazing rights to my grandfather, Mnr. J.H.Erasmus : a Salt Transporter between Swakopmund and Windhoek - by Ox Wagon - no less! When my father, Mr. W.F.Mans, a pharmacist, moved to the Khomas Hochland i.e. : the central highlands west of the capital Windhoek in 1967 most of the basic infrastructure had been completed. But the cattle were typical of the area: large, rangy Afrikander types with spread horns and well developed survival instincts. The first Hereford bulls were purchased in the 1970's and after the trauma of adjustment lasting approximately two years, the resultant progeny were spectacular to behold. These trails led to be the establishment of THE FORMIDABLE HEREFORD STUD in 1980 based on horned cattle with plenty of Syferpan breeding. 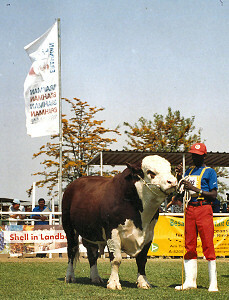 In 1990 my father retired and for the sake of uniformity the JOHN BULL HEREFORD STUD was born. Our Herefords must do well in our arid, marginal environment. Our Herefords must maintain the legendary fertility of the breed. 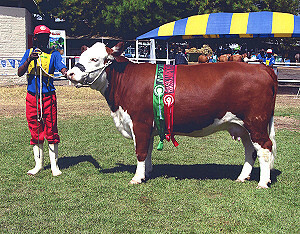 Our Hereford must be easy-fleshing, early maturing and well muscled animals. Our Herefords are preferred with full eye pigment and short coats. John Bull Herefords perform at 2000 metres at temperatures of between minus 5 and plus 38 degrees celsius with quartz-gravel underfoot and a maximum of 3 months of natural green pastures a year ! John Bull Hereford cows never fail to amaze with their reproductive prowess. Even while in dire st raits, they manage to settle and calf on a regular basis when many other breeds fail to do so ! As a rule, John Bull Hereford bred steers are marketable at 24 to 30 months and heifers are ready to breed at 14 to 16 months - calving at between 24 and 36 months. A large proportion of our herd are spectacled and the majority are fully pigmented. We believe that Good Business needs to be a mutually rewarding experience. We sell sound, honest and gentle cattle at reasonable prices. 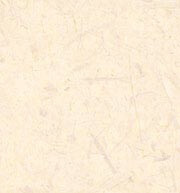 We respect our customers and value their support and advice at all time.